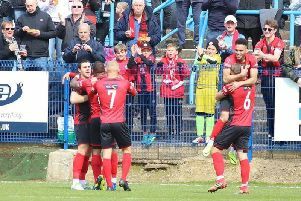 Top scorer Rhys Hoenes grabbed the only goal of the game as the Poppies secured a 1-0 success at Halesowen Town to finally wrap up the title while, in the process, condemning the hosts to relegation. Backed by a huge travelling army of fans, Kettering turned in a workmanlike display to seal the deal and ensure they can now look forward to what is set to be a return to the Vanarama National League North next season. And the success left Law reflecting on what has been a highly impressive campaign with the Poppies currently 12 points clear of the rest with three games to spare. 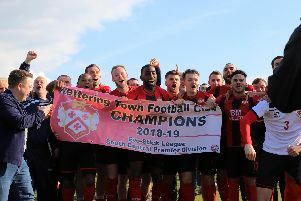 “It’s been four years, it’s been turbulent and emotional but credit where it’s due, this squad has been fantastic all year,” the Kettering manager said. “I thought this performance typified what we are all about. “We minimised the opposition comfortably and we had a bit of quality when we needed it. “It’s a great day and when you look at the season as a whole, e hit the ground running and made everyone else chase us. “I think the biggest thing is that we haven’t lost two league games on the bounce to this point. That shows good character. “We went through a November and December, which weren’t great and allowed Stourbridge to get close but we had that good run in January where we won some big games. Law paid tribute to the club’s board for sticking by him after three seasons of being unable to clinch promotion to the next level. After missing out in the play-offs last year, Law was entrusted to launch another assault on promotion this time and it has proven to be the right decision from the club’s hierarchy. “You have to give credit to the board,” he added. “There are high expectations and you have to try to meet them and if you aren’t hitting the mark we have hit today then questions will always be raised. “So fair play to Ritchie (club owner Jeune) and everyone else because in years one, two and three they stuck by me and believed in what I thought we could do.